On Good Friday, April 8, 1966, an issue of Time magazine shook the nation. 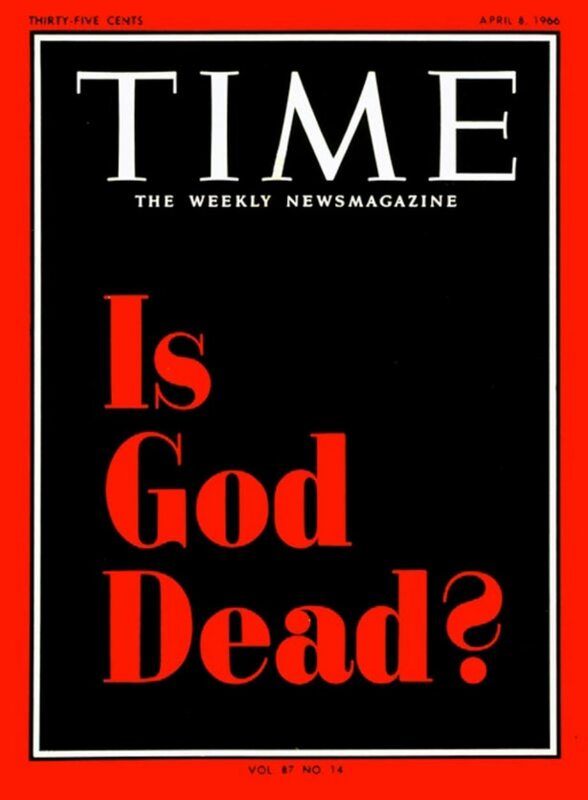 The cover was black with bold red letters as if written in blood, asking “Is God Dead?” In the next six months, almost thirty additional periodicals weighed in on the issue – the nation was abuzz in a discussion about the alleged death of God. Evangelicals and conservatives reacted strongly. Nietzsche said poetically, the ‘long shadow’ of God was all that lingered. Thus, God is not so easily dismissed. Pronounce Him dead, have His funeral, but He lives on – and His shadow remains. It is with this ‘shadow’ that our culture now struggles. Having legally rejected our founding faith, the idea of God lingers, and for some, it is like a cultural hangover. For others, He is a ghost – one that is far too real. Against this ‘ghost’ of our cultural past, there is a veritable war – to silence public prayers, to remove from our vision public crosses, to ban the use of the name of Jesus – to remove the shadow. ‘God is dead’, and He must remain dead – it is the continued crusade of Nietzsche-like followers who, like him, know that humanism can only blossom in the absence of a shared social, cultural faith. Most amazing of all is the silence of believers themselves, who live as practical atheists, without prayerfully considering God each day at dawn, without intentionally inviting His participation into their lives. There will be little hope for the nation if the church, if Christians continue to live without an integrated sense of God’s Presence. Without living as missionaries, and getting beyond self-interests, there is no hope that the unredeemed will lead the way to awakening. Most Christians see faith as a moral philosophy, a set of rules or principles, a guide for private morality, as something almost mystical, shrouded in nostalgia, or something inside them, like a pietistic component of their personality. That reduces God to a moral or intellectual principle, not a dynamic, unpredictable person. Ours is a living God. He is not a list of moral imperatives, not a standard for justice and empathy. Moreover, to live the Christian life is to live out of the center of God’s life, not church-life, but divine life. It is not the integration of God into our lives, of faith and biblical concepts into our head and heart; it is the integration of our life into God’s life. It is not His joining us on our journey; it is our taking our cross to follow Him in His post-resurrection mission; and doing so out of a life of dependent prayerfulness. ‘God is dead, I tell you, we have killed Him – you and I. All of us are His murderers.’ But how did we do this? How could we drink up the sea? Who gave us the sponge to wipe away the entire horizon? What was the holiest and mightiest of all that the world has yet owned has bled to death under our knives : who will wipe this blood off us? Of course, he is right. God came, in Christ, and the whole world conspired to kill Him, to crucify Him – and we all, sinners all, are culpable. However, the greater tragedy is that the crucifixion of Christ continues. Today He is rejected again, not only by men, but also by movements and corporations, by cities and nations. Moreover, as it was then, the witnesses, who know better, who know who He is, we, the disciples, are silent again. Every prayer, every bowed head – is a declaration of faith in the existence of God. Every whispered prayer, every searching heart, every upward gaze, every silent moment before the wonder of some inspiration of creation is a soul longing to connect with God. We call that prayer! Prayer is instinctive – we do it naturally. Yet, deep prayer, transforming prayer, demands a certain cultivation. Against that kind of prayer, there is a war. It is a war fought from the inside of each of us – the resistance of the flesh. It is a war fought by hell itself. It is a war fought by the world around us. Sadly, prayer is losing. As a result, we are losing as well. Current product special: Heaven is a Courtroom (4 CDs) for $12. Topics include: Three Aspects of Prayer, Filing Your Petition, Pleading Your Case, Integrity, Building Your Case and Breakthrough (Intensity in Prayer). Ronald Rolheiser, The Shattered Lantern (New York: Crossroad Publishing, 2015), 18. Martin E. Marty, “Practical Atheism: Atheism in America”; December 12, 2011; divinity.uchicago.edu/sightings/atheism-america-%E2%80%94-martin-e-marty. Calvin Miller, The Vanishing Evangelical: Saving the Church from Its Own Success by Restoring What Really Matters (Baker Books: Grand Rapids, MI; 2013), 57. There cannot be a more ridiculous question than this, yet it is our reality to deal with; even so come Lord Jesus. Thanks Bro Doug.